St David's Hall is the National Concert Hall and Conference Centre of Wales. It is home to the famous Cardiff Singer of the World Competition and the annual Welsh Proms Cardiff. It was officially opened by the Queen Mother in February 1983. The 2,000 seater venue provides a comfortable setting for a whole variety of live entertainment from pop to classical music, and from comedy to dance. It also hosts regular exhibitions and conferences. In addition to its primary use as an entertainment venue, St David's Hall also offers conference facilities and is a suitable venue for conventions, meetings, training seminars and private lunches. Bars: St David's Hall has 2 bars located on Levels 3 and 5. Both offer an interval drinks ordering service and both provide big screen facilities during rugby internationals. Art Café Celf: Snacks, cakes and hot drinks are available in the newly refurbished Art Café Celf situated on Level 4. The Café is open Monday-Saturday from 10am-3pm. Celebrity Restaurant and Gallery: Those wanting a pre or post show lunch or dinner can visit the Celebrity Restaurant and Gallery on Level 1. The lunch menu offers a choice of 'lite-bites' and a carvery option whilst the dinner menu offers a selection of Welsh and European dishes. The Celebrity Restaurant is open Monday-Saturday from 12pm–2pm and from 5.30pm when there is an evening performance. For further information on eating and drinking at St David's Hall call 029 2087 8453. 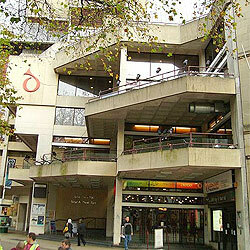 Cardiff Central Train Station and Cardiff Central Bus Station are a 5 minute walk away from St David's Hall. The venue is situated in the Hayes area of the city centre.